AT&T MVNO H2O Wireless is running a promotion that gives users a 10% discount in return for signing up for auto-pay, which H2O calls auto recharge. The discount is a limited time promotion. You need to enroll in auto recharge by April 19, 2014 to be eligible. The discount itself applies for 12 months after signup. Auto recharge can be used with any plan, except family plans, but the only frequency choices are every 7, 14 and 29 days which makes using it with H2O's 90 and 365 day pay as you go plans impractical. I don't get the point of the 29 day duration either as H2O's monthly plans expire every 30 days. 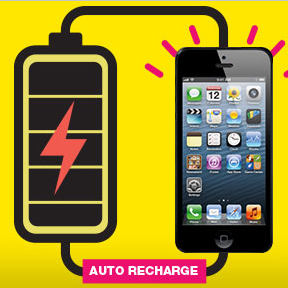 The discount is for new auto recharge signups, current auto recharge users aren't eligible. Presumably, current auto recharge users could cancel auto recharge and re-enroll to get the discount. To enroll in auto recharge, log in to your H2O online profile and click the "No time to keep track of expiration date?" link. 2 $50 2 GB plan is reportedly throttled after 1 GB, $60 "unlimited" data is throttled at 2 GB and cut off at 3 GB. Throttled speed is approximately 128 Kbps. I was not throttled after 500mb on the $40 1gb plan. Interesting, maybe H2O has stopped throttling that plan. The un-advertised throttling has been the worst thing about H2O. Is there Tax on auto-pay? Possibly state sales tax for customers in New Jersey where H2O is based, otherwise no taxes. I was already on "auto recharge," so I decided I'd better cancel and re-up to get the 10% discount, as was suggested here. I went to do that and got a dialog box that said something like "if you cancel your auto recharge you will lose your 10% discount." So, apparently, those of us already on auto recharge were automatically grandfathered and get the discount. Great question. Customers who are already enrolled in the auto recharge program prior to 02/18/2014 will not receive the benefits of the 10% discount. We do apologize for any inconvenience this might have caused. Like · February 19 at 1:26pm"
It is a good deal, but to limit it for just a year is a negative. I had H2O and it was horrible. Constant throttled with the $60 plan. When called customer care after 2 hours and 45 minutes on hold I was told that they couldn't do anything about it. Switched to Boost and haven't had a problem so far. Locus. All their MVNO's are abysmal for CS. Good luck on enrolling in auto-recharge!! Online form would not work, so called customer service. H2O has the worst customer service ever!! Well, since I was on Auto Recharge previously I tried the cancel and then re-up thing, and at the time I did it H2O indicated I would be paying $27 per month ($30 less 10%). However, come recharge time today I received an email saying I was being charged $30, which I confirmed by checking my credit card account. I filed a complaint via email. Haven't heard back yet. After setting up auto-recharge, I paid $27 the first month and then saw on my online account it would be $27 the next month, but a day later it flipped to $30. I chatted with help and said billing has to do it and they'll call me. Billing never contacted me, but online it magically changed to $27 for next month. A few days later it changed back to $30. Arrrgh! IMO 10% discount is false advertising. That's not good for H2O. Otherwise great value for what you get. Update: April 1 2014, H2O will allow call forwarding. More detail, I was told to call in to activate this feature if needed. Not sure if it will be conditional or unconditional. But at least we should be able to use google voicemail. I don't know why we have to call to activate, if it will be available, then we should be able to activate it through the phone without calling. Wait and see. I have always had success with their chatting function.